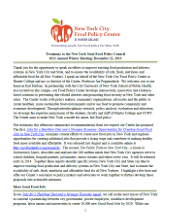 On July 15, 2015, NYC Food Policy Center staffer Ashley Rafalow presented testimony focusing on the need for greater coordination statewide of food activities and workforce development, growth in the public food sector, and a commitment to discouraging promotion and reduced availability of unhealthy food, especially to children. 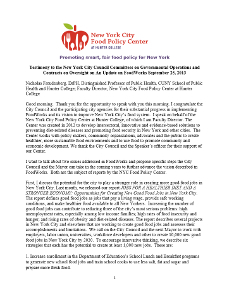 On May 13, 2015, NYC Food Policy Center Policy Director Jan Poppendieck presented testimony focusing on the need for universal free school meals, increased SNAP benefits, and a White House Conference on Food an Hunger. On April 13, the New York State Assembly Committees on Consumer Affairs and Protection and on Health met in New York City to hear testimony on Assembly Bill 2320-A, which would require manufacturers of sugar-sweetened beverages to place a safety warning on those beverages and in places where the beverages are served. On March 25, 2015, the New York City Council Committee on Education, chaired by Councilmember Danny Dromm, held a Fiscal Year 2016 preliminary budget hearing. Among the interest groups appearing to present testimony to the Council were supporters of universal free school meals citywide. Here we provide an overview of the testimony and events of the day focusing on the effort around universal free meals in all New York City public schools.